Buying or refinancing a home with an FHA mortgage allows you to finance a home with very little down. In addition, mortgage underwriting for FHA products is more flexible and generous than it is with other programs. But FHA fees and mortgage insurance, which make the program possible, are not always well-understood. Conventional Vs. FHA: What’s Better For You? The beauty of the FHA program is its government guarantee. Most lenders would not be willing to lend 96.5 percent on a home unless the borrower was perfect and paid a high interest rate. But with the FHA guarantee, they are willing to lend, at low interest rates to less-than-perfect homebuyers with 3.5 percent down. However, the FHA guarantee comes at a price. The U.S. Department of Housing and Urban Development (HUD) administers the FHA loan program, but private mortgage lenders actually approve and fund the loans. You, the borrower, pay mortgage insurance premiums, which cover the lender’s losses if you default on your mortgage. FHA mortgage insurance comes with both an upfront premium and an annual premium. The upfront MIP is 1.75 percent of your loan amount, and you can add it to your loan amount if you don’t want to pay it out-of-pocket. Annual premiums vary according to your loan amount, loan term, and down payment. The table below shows the annual premiums. Lenders divide the annual amount (which is re-calculated every year) by 12 and add it to your monthly payment. FHA loans with terms of 15 years or less qualify for reduced MIP, as low as 0.45% annually. How Much Does MIP Add To Your Mortgage Payment? MIP adds a few costs to your home loan. Assuming that you, like most people, finance the upfront charge, here’s what it might look like for a $300,000 home purchase. You can see that while conventional (non-government) loans are cheaper for those with excellent credit, they aren’t if you get hit with risk-based surcharges. 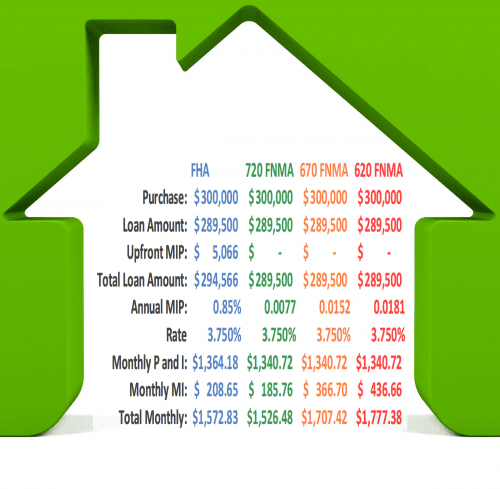 So what’s better, FHA or conventional? That depends on your credit score, how much you have for a down payment, and if you’re eligible for the HomeReady program, which comes with discounted mortgage insurance. FHA Vs. Conventional 97 Mortgage: Which Is Right For You? FHA mortgage insurance is always the same, no matter what your credit score. But a low score can add a lot to your monthly expense if you go with a conventional loan. For instance, in the example above, the person with a 620 score would pay about $200 a month more with a FNMA (Fannie Mae) loan than with an FHA loan. Perhaps the biggest drawback of FHA financing for many is the fact the annual MIP never expires. Unlike PMI, the private mortgage insurance you’d pay with most conventional loans, MIP never goes away, even after you pay your loan balance down to less than 80 percent of the home value. However, it’s not as bad as it sounds. Imagine that you have a conventional mortgage at 3.75 percent. It will take you 112 months (over nine years) to get your balance below 80 percent. At that point, you can request termination of your mortgage insurance. Up to that point, you’ll have paid about $20,764 if you have a 720 FICO, $40,989 with a 670 FICO, and a whopping $48,809 with a 620 FICO. While MIP for a similar FHA loan for life is about $64,000 the odds are pretty good that you won’t be paying that much. For one thing, most people sell their homes or refinance their mortgages long before they’d have their mortgage paid down to less than 80 percent. If you plan to have your home for just a few years, it won’t matter that your FHA MIP does not expire. If your credit is great and a conventional loan with PMI would cost less than an FHA loan with MIP, that’s probably your best deal. But if you have some blemishes, have your lender run the numbers for both the FHA and a conventional loan, and choose the one with the lowest cost. Mortgage rates today are amazingly low. They had been trending up, and then they fell back down. To get your best rate, contact several lenders and compare. Choose the one with the best deal for you.